Too bad you can't grow weed in your front yard. I notice some people in my neighborhood let their sunflowers grow in their front yards. Our neighborhood has a lot of established vegetation, it is older so some interesting things pop up in yards here. Some of it I love and some of it I think looks more like weeds. I'm on the fence about Sunflowers. If you had them popping up in your yard would you pull them out or let them grow? I think I would let them grow in the back yard if they were in some of my less formally landscaped flower beds, but wouldn't look right out front. A weed is any plant that is growing where it is not wanted. That is why corn is considered a weed if it comes up in a soybean field. A weed is a plant of which mankind has not found a use for yet. There are uses for corn but corn growing in a soybean field is still considered a weed. 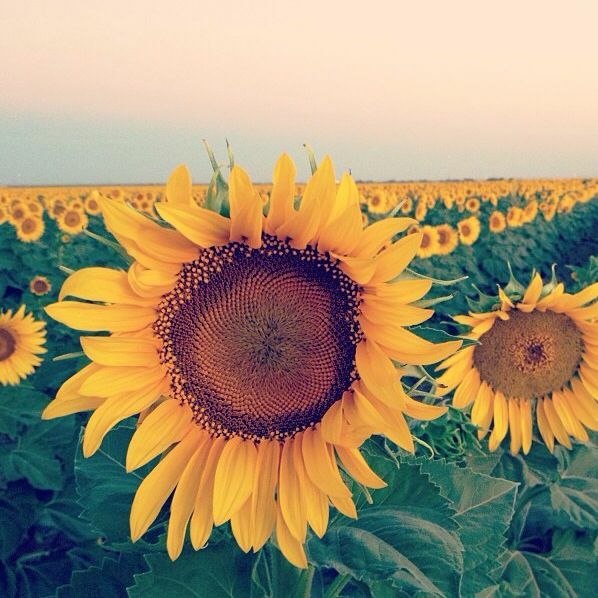 We have acres, acres and acres of cultivated sunflowers out here on the South Plains. I've seen some rural homes with a plant or two planted around their buildings as ornamentals. These plants can produce a seed head that well over a foot in diameter. In my opinion, sunflowers are one of the most "useful" plants and they look good, so if one randomly started growing in my front or back yard, I wouldn't pull it. However, if you really do not want it to be where it is, you should pull it out. Should come down here and I could take you to the Ohio River bottoms where a couple farmers will plant 20-30 acres of sunflowers for the wildlife to feed on. Deer love them! I grow wildflowers in a small area beside my water garden. You DO NOT tend wildflowers. They don't like it! You rarely water them and fertilize carefully because most fertilizers are heavy on nitrogen, which grows big leaves, but not blooms. For better blooms, use a fertilizer heavy on phosphorous - that's the second number on the package. Like 10-50-10. As much as I love my wildflowers and the mosquito eating dragonflies they attract, I do not allow sunflowers in my water garden area. But that's only because they don't they are too tall for what I've got going on. Black-eyed Susan, yes. I love sunflowers but they don't love me. I love sunflowers! I would never consider them as a weed! They attract bees which are all dying but perhaps they will eat the sunflowers and live again. I buy 10 pound bags and 20 pound bags of "Bird Food". (They only contain sunflower seeds) I scatter them everywhere and then I put soil on top of them. For best results, Sunflowers love water and they also love partial shade (lol). The sunflowers survive through heat (with water) and they even survive through freezing temperatures (for a few hours only. They do not live through snow.) I have had some sunflowers grow to 10 FEET! I love my sunflower jungle. and I do not care if it bothers the neighbors. Another talent I have is seeing how many things I can do to annoy people when it has absolutely nothing to do with them. I have to say, I have never ever seen sunflowers growing on the sides of roads.